It was this huge headline on one of the British newspapers last week saying: definitely twins. Some kind of celebrity participant in reality shows had diagnosed that these morning discomforts of the future queen meant twins. At least now we know what’s going wrong with the NHS! The same time a couple of totally despicable and disrespectful Aussies dared to pull a hoax to the future Queen. By the way, nobody questions security and their failure to do what they are paid for while every single Brit is losing their famous British humour and they go after a couple of radio producers who did exactly what they are paid for. The same time news like the deadlock of the British economy, the failure of education and health system, the reality of European financial situation, the dramatic rise of unemployment and homeless gets lost somewhere after the forth page; the third page is always occupied by other more important ...breasts. I know, I know. I don’t understand! I heard it before and the truth is that I don’t understand. I do understand that people need idols; I do understand that the royal family in England represents national unity and I do understand that after decades of scandals they need something easy, something they can promote and make the common people empathize. Or perhaps I’m totally ignorant. But let me tell you what happened to me last Sunday. We often have guests in the radio show, the Ovi wild ride. 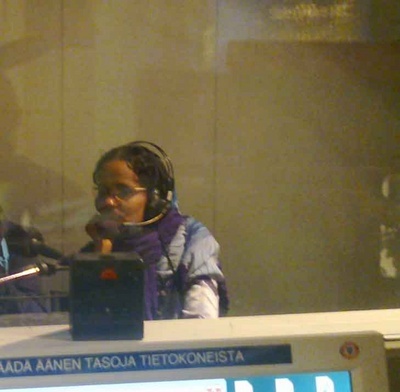 The radio show is every Sunday afternoon on Finnish radio; an easy going show with a lot of talk, news and music. The age difference between me and my co-host Edna – a couple of generations gap - makes our conversations sometimes tense even funny and when we have a guests this age gap makes it far more interesting. Last Sunday we had for a guest a very young lady who had come from for a visit to Finland, to be awarded for her participation in a film and try to raise awareness for the people of West Sahara. Her name, Memona Mohamed. A very young and beautiful girl Memona looked so tiny and fragile in the radio studio. Knowing that she had spent the last week with interviews where the only questions she had to deal with were about West Sahara and the situation there we decided to avoid them and get more personal. After all we had in front of us a girl that born grew up and lived in a refugee camp and this was the second time in her life out of that camp. Just stop and think what I wrote. This is a 26 year-old girl who born in a refugee camp lacking everything. Everything we have around us didn’t exist for her. She grew up in a refugee camp lacking everything a girl of her age has. Everything we have around us she didn’t know. And now in her 26 she still lives in a refugee camp lacking everything. Everything we have around us with one small difference, now she knows. The conversation was smooth and easy going after all this is the spirit of the show – without that meaning when it is necessary we cannot be critical and even aggressive – and in one point my co-host asked her, what you are dreaming, what you want. And for the first time in my life I understood how tremendous can be the sound of silence. The little girl heard the translation of the question and she put her hands in front of her eyes and for a tiny little second we heard a sob through the headphones. And this sound will hunt me for the rest of my life. Everything was there, the dreams and the death, the loss. I don’t know what dreams this girl had before coming out from the refugee camp where she born, she grew up and she became a woman but I’m afraid meeting the “real” world killed them all. Do you want me to be cynic? I can be. Of course Polisario will use her shooting stardom. They will use every single bit of it for the cause and most likely after using the last bits they will return this girl to the camps with a pack of photos of her glorious moments. Even her awards will decorate in the end some offices of the organization somewhere in Algeria. I can be more cynic if you want after all other liberation armies in the past have shown us the path but …but the sound of silence and her sob will always be with me. And despite the hour she spent with us in the studio, despite the jokes we did about the snow – Finland is white this moment with temperatures Memona had never felt before – despite all the effect we did after to talk about other issues, it was this few seconds that lasted for ever that is left from this radio show. And you know I write often about it. I write about it in Ovi magazine and all the magazines I write for, there are thousands Memonas this moment in this world and there are 30,000 Memonas who die every single day somewhere in this world. No, no Memonas, 30,000 kids. Kids in camps, in fires, in wars, in the cities and the villages, in the west, east, north and south. In the industrial west and the agriculture south. And the sound of Memona’s silence and her sob are like a weeping for all of them, the dead and the alive. And I wish for one moment we could all hear it. You see this moment newspapers and magazines from the frozen Finland to unemployed Greece – to talk only about Europe – have photos and special reports about Kate and her pregnancy, celebrities give their opinions and diagnosis and Memona sobs for the dreams that will never come. I have nothing against Kate, the future queen of UK after all has exactly the same age with Memona; on the contrary I hope she will have a smooth and easy labour. The girl that has everything! The first ten minutes missing because I was so overwhelmed with Memona’s presence and the things we said before starting the show so I forgot to …start the recorded. This Sunday December 9th we are going to talk about Ovi books and especially about David Sparenberg’s “Life In The Age Of Extinctions” David has been nice to honour us with recording a dramatic reading of two of his poems from his book that we are going to include in the show. I’m going to replace the show sometime on Monday in the same link in a case you want to hear it. Memona arrived in Alger on Monday but she had to stay, instead of going to the camps. Another film festival is waiting for her! Sir, you have a Beautiful and Compassionate Soul. My Best Thoughts and Meditations are with Memona, and others who similarly share in her unfortunate circumstances. Thank you, and Asa, and Ovi, and your Crew for all of the fine Humanitarian and Humane Work and Outreach that you do.